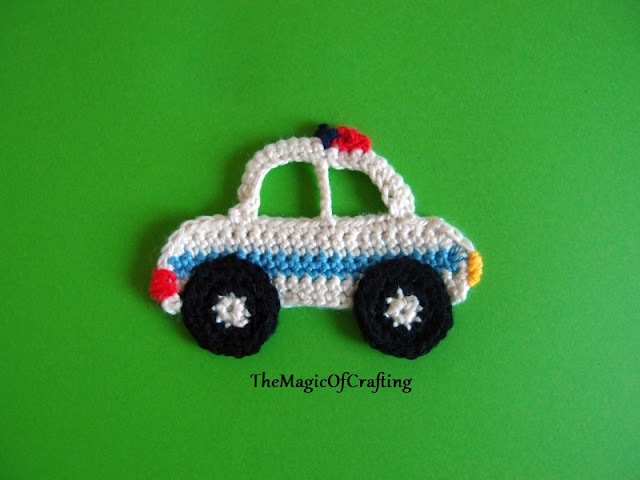 This crocheted police car is a nice finishing touch to every project for little boys. 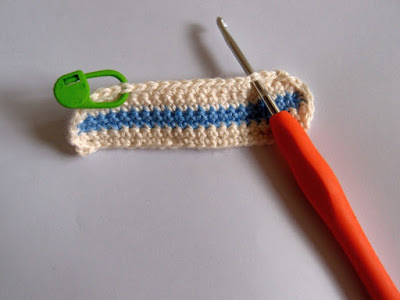 It can be made for hats, vests, bags or any boy garment. Row 1: With white ch 23, sc in second st from hook, sc in each ch till end (22 st), turn. Row 2: Ch 1, sc in same st, sc in each st till end (22 st), turn. Join blue. Row 3: Ch 1, sc in same st, sc in each st till end (22 st). Turn. Row 6: Join white again. Ch 1, sc in same st, sc in each st till end. Turn. Row 7: Ch 1, sc in next st. Sc in each st till only 2 st left, sc2tog. Turn (20 st). Row 8: Repeat row 7 (18 st). Now make a round of sc with white around the "body" of the car. It's time to make the upper part. 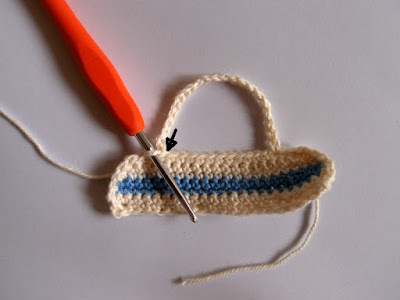 Count 4 st from both sides and mark them with stitch markers, this is where the upper part will be attached. Join white in one of the markers and ch 22, ss in the marker of the other side. Turn the work and make a ss in the next st (in the inner st). Now make one sc in each ch and finish with a ss in the st next to the first where the chain started (inside the top part again). Now join yarn in the middle st of the top row (5-6th st if you count the stitches inside the top of the car). See the picture below. Ch 7 and join it in the middle of the cars top (around 11th st). That's for the car body. With white colour - in mc ch 1, sc in the mc, make 7 more sc, end with ss in ch1. Join black - ch 1, sc in same st, 2 sc in each st (16 st). Ch 1, sc in same st, repeat *sc, 2 sc* till end of the round, join the circle with ss. The front and back lights are simply sewn with yellow and red yarn. Police lights on the top: with red ch 3, sc in second from st from hook, sc. Join dark blue and ch 2, sc in second st from hook. Now sew it on top of the car.